A reward of up to $6,000 was being offered Wednesday for information leading police to two men who got away with several dozen luxury watches from a jewelry store at the Westfield North County mall last week. Following the armed holdup at Royal Maui Jewelers at 200 E. Via Rancho Parkway at about 8:20 p.m. on July 22, the two suspects drove off in separate light colored cars, Escondido Police Lt. Eric Skaja said. 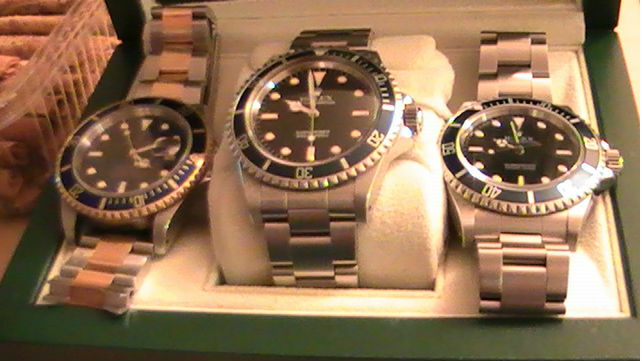 The two men took around 40 Rolex watches worth about $480,000, 10News reported. Escondido Police said both suspects were black, wore glasses and carried handguns. One was in his late 20s, about 6 feet tall and wearing a long sleeve beige Pendleton-style jacket, a baseball cap, an earring in his left ear and a tattoo, possibly of a music note, on the left side of hie neck. The other suspect was in his early 30s, about 6 feet 1, with a muscular build and a “clean cut look.” He was wearing round diamond studs in both ears, a beige Pendleton-style shirt, black combat boots that were not laced up all the way, and a light green camouflage hat with “Marines” on the front. Anyone with information on the robbery was asked to call Crime Stoppers at (888) 580-8477. Tipsters may remain anonymous and could be eligible for a reward of up to $1,000 from Crime Stoppers, and the jewelry store has put up another $5,000 for information that helps identify the suspects.